Should Churches Damaged by Superstorm Sandy Receive FEMA Funds? Read more about Should Churches Damaged by Superstorm Sandy Receive FEMA Funds? Why does Obama call it "freedom of worship"? “Today, President Barack Obama continued the tradition of observing Religious Freedom Day with a presidential proclamation. Read more about Why does Obama call it "freedom of worship"? Moore: "...we now have a de facto established state church." Read more about Moore: "...we now have a de facto established state church." 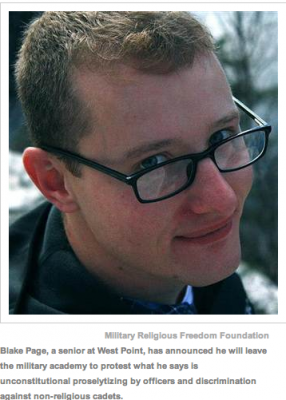 West Point Senior quits ... cites "proselytism ... in the name of fundamentalist evangelical Christianity"
Read more about West Point Senior quits ... cites "proselytism ... in the name of fundamentalist evangelical Christianity"